Leica Camera AG is a leading German optical company that has been designing and developing 35 mm cameras since 1913, and manufacturing them in series production since 1925. Leica Camera AG is also responsible for Leica Binocular production, Leica began producing binoculars in 1907. 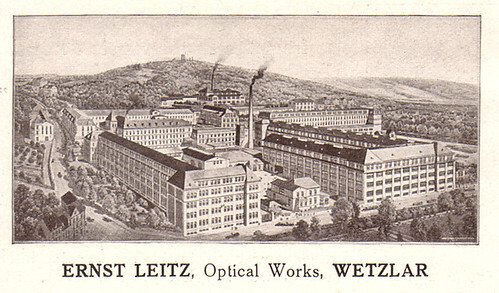 The company, formerly Ernst Leitz GmbH, is now four companies: Leica Camera AG, which produces cameras; Leica Geosystems AG which produces geodetic equipment; Leica Microsystems GmbH, which produces microscopes; and Leica Biosystems, wich produces clinical diagnostic equipment. Leica Camera AG has production plants in Germany and Portugal, the headquarters of Leica Camera AG is situated in Wetzlar, Germany. 2005: Leica Camera AG has lost market shares and starts a rescue plan for economical survival. The expensive digital module for the R8 and R9 analog SLRs is a huge success. 2014: Leica Camera returns to Wetzlar. 2018: The company's return to Wetzlar is completed with the opening of the Leitz-Park Area. Note: Capital letter model designations were used in Europe; Roman numerals were at first used in USA, and became universal after the Model G (IIIa). There is often confusion between the sub-letters in lower case used on the Roman numeral designations, and the capital letters used in the earlier screwmount models; they do NOT equate! Apparently there were no Models Ie, IIe, or IIIe. Also the III is not the same as the IIIa. There are many minor variations that did not rate a change in designation. Leica produced and still produce many lenses for the famous M-mount. The Lenses are named based on their aperture. Many Leica-branded compacts used electronics from Panasonic, and may have actually been manufactured by the Japanese company. 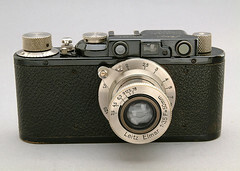 The Leica camera was imported into Japan in the early 1930s by Schmidt Shōten. It was advertised by various other retailers, such as Kinjō Shōkai, Asanuma Shashinki-ten or Hattori Tokei-ten. 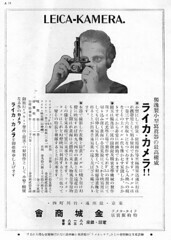 Advertisements for the Leica in Asahi Camera. 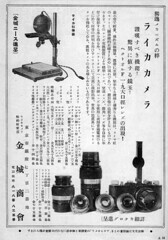 Advertisements for the Leica in Shashin Salon January 1934. 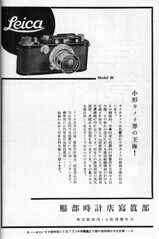 Asahi Camera. Advertisement by Kinjō Shōkai in February 1930 (p.A11) and June 1932 (p.A12), and advertisement by Schmidt Shōten in June 1932 (p.A31). Shashin Salon. Advertisements by Asanuma Shashinki-ten, Hattori Tokei-ten and Schmidt Shōten in January 1934. Rogliatti, Gianni. 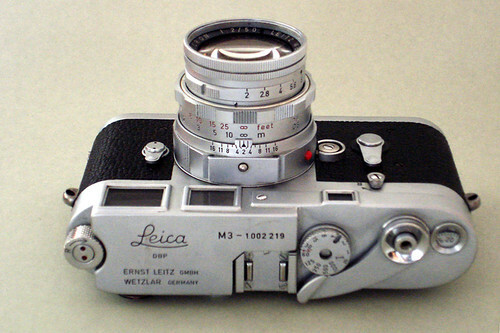 Leica. The first 60 years. Hove Collectors Books, Hove (UK), 1985. ISBN 1-874707-02-2. 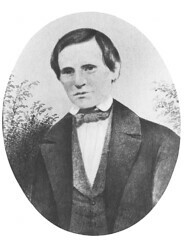 Leica page at Wikipedia, with a comprehensive company history. Leica Cameras Price Guide ~ Compiled prices from recent completed auctions.